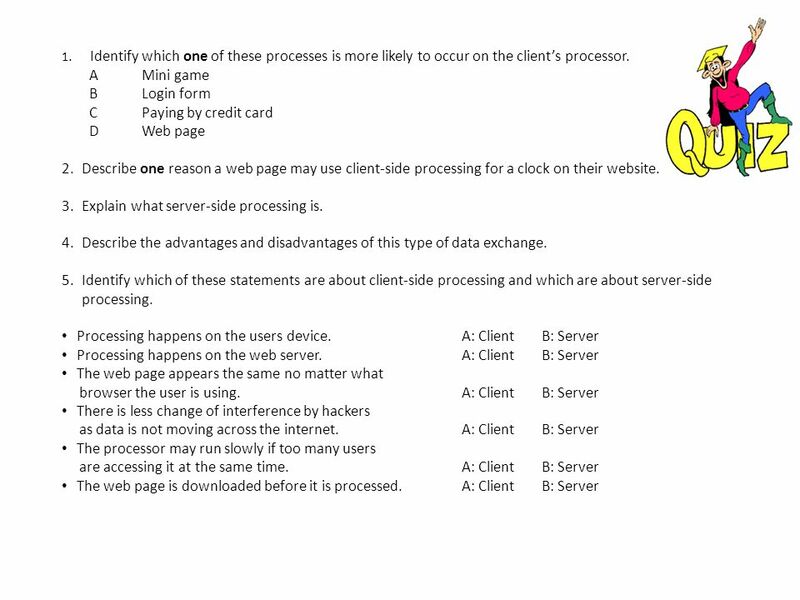 Client-side processing uses the clients computer to process web page data in data exchange. 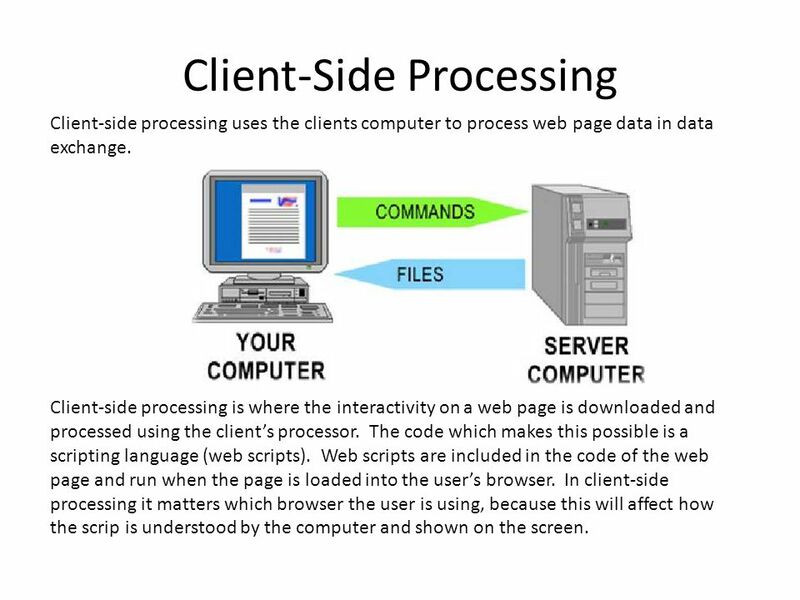 Client-side processing is where the interactivity on a web page is downloaded and processed using the client’s processor. The code which makes this possible is a scripting language (web scripts). Web scripts are included in the code of the web page and run when the page is loaded into the user’s browser. 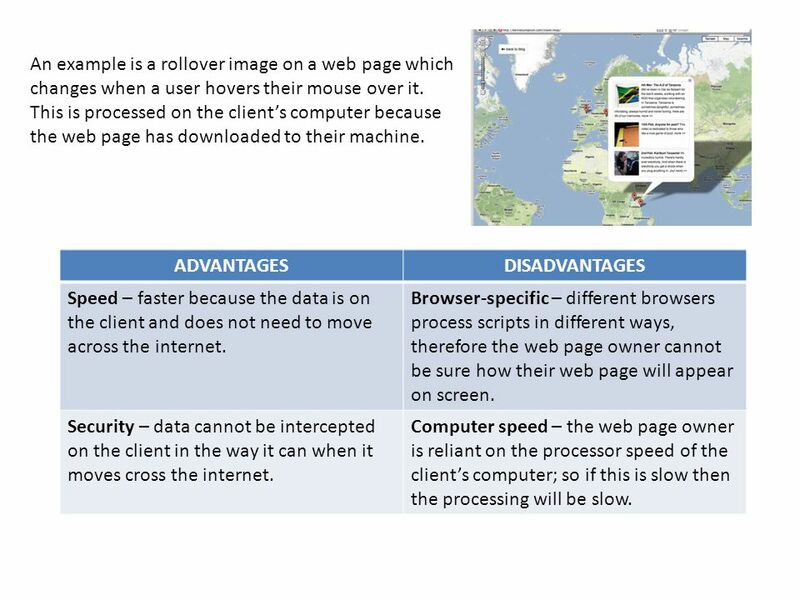 In client-side processing it matters which browser the user is using, because this will affect how the scrip is understood by the computer and shown on the screen. 2 An example is a rollover image on a web page which changes when a user hovers their mouse over it. This is processed on the client’s computer because the web page has downloaded to their machine. ADVANTAGES DISADVANTAGES Speed – faster because the data is on the client and does not need to move across the internet. Browser-specific – different browsers process scripts in different ways, therefore the web page owner cannot be sure how their web page will appear on screen. Security – data cannot be intercepted on the client in the way it can when it moves cross the internet. Computer speed – the web page owner is reliant on the processor speed of the client’s computer; so if this is slow then the processing will be slow. Server-side processing uses the web server to process web page data. 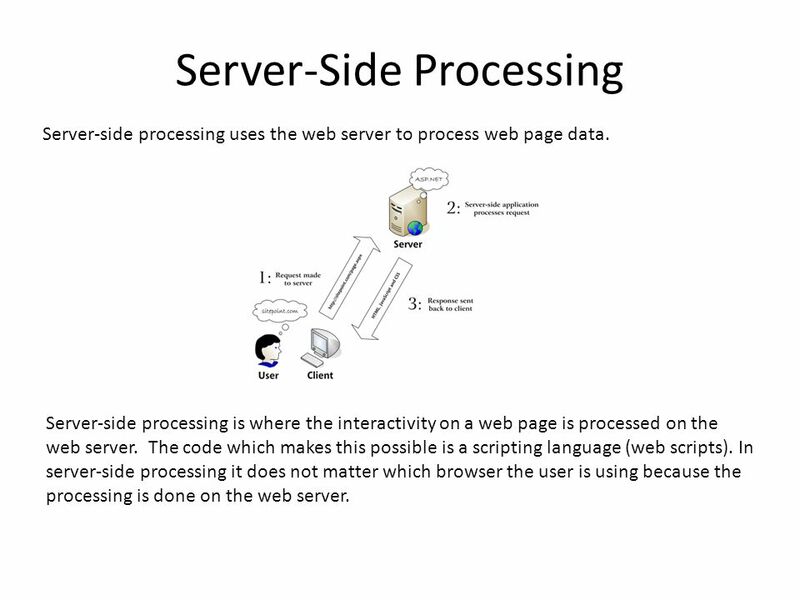 Server-side processing is where the interactivity on a web page is processed on the web server. The code which makes this possible is a scripting language (web scripts). In server-side processing it does not matter which browser the user is using because the processing is done on the web server. 4 An example is a form completed online which is filled in by the user then submitted to the server where the results are processed and stored. ADVANTAGES DISADVANTAGES Efficiency – the information to process does not need to be downloaded to the client’s computer. Security – when data is transferred across the internet it is more at risk of security threats. Browser independent – it does not matter which browser the user has as the work is done separately on the server. 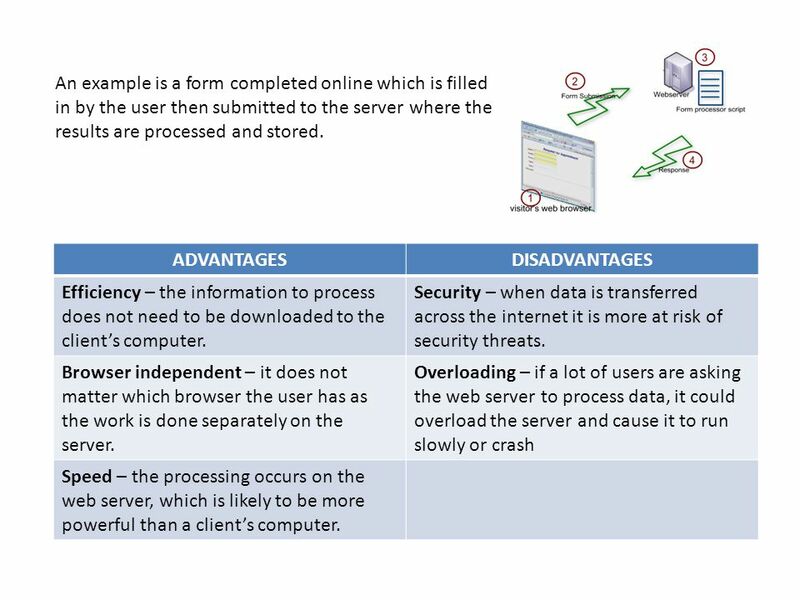 Overloading – if a lot of users are asking the web server to process data, it could overload the server and cause it to run slowly or crash Speed – the processing occurs on the web server, which is likely to be more powerful than a client’s computer. 5 Explain what server-side processing is. CompSci Applets & Video Games. CompSci Applets & Video Games The Plan  Applets  Demo on making and running a simple applet from scratch. Administrative  Philosophy  Class survey  Grading  Proposal (5 points max)  Small projects (10 points each max)  Project (40 points max)  Presentation. Active Server Pages Chapter 1. Introduction Understand how browsers and servers interacted when the Web was young Understand what early Internet and intranet. Administrative  Philosophy  Class survey  Grading  Project  Presentation. Explaining the principles of web animation Gladys Nzita-Mak. COMPUTER TERMS PART 1. COOKIE A cookie is a small amount of data generated by a website and saved by your web browser. Its purpose is to remember information. ITIS 1210 Introduction to Web-Based Information Systems Chapter 41 How Animation on the Web Works. Introduction to Java CSIS 3701: Advanced Object Oriented Programming. Lesson 8 DATA EXCHANGE. Transmission Modes Type 1 - Simplex  Simplex transmission: sends data in one direction only. A radio broadcast is a good example. Demystifying Backdoor Shells and IRC Bots: The Risk … By : Jonathan. Client-side processing 26 Client-side processing 26.